When independent film production company Shadowland was originally founded, the plan was to be producing 3-5 films a year by 2005. By the end of March, 2003, the young company had a number of films in development, but none that would afford all the principals of Shadowland, as well as its key personnel, to collaborate creatively on a single project. Therefore, the decision was made that Shadowland's first production should be developed internally and that it should commence principal photography by the end of June 2003. Writer-Producer Bud Robertson was given the task of coming up with several story concepts, from which one would be selected for development. From the Shadowland staff, founder and president Robert Ballo co-produced the film with Robertson, and also served as director of photography, Ed Bishop edited the film and served as post-production supervisor, Brian Dillingham served as line producer, and Phil Leirness directed. Of the half-dozen or so concepts that Robertson pitched, one was about a teenage girl from a single-parent home, who attempts to commit suicide. This close call convinces the girl's workaholic mother that they need to get away together for the summer - rent a house somewhere and get to know each other. Upon arriving at their "Shangri-La" in the hills, Kelly is befriended by ghosts. 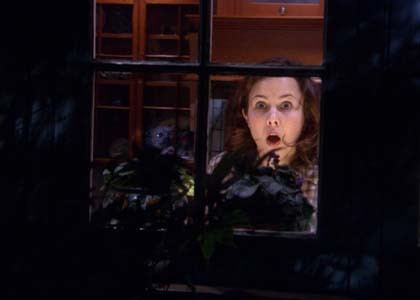 Are these ghosts real, or is Kelly going crazy? This question, coupled with an unexpected plot twist and the rich terrain for thematic exploration that the concept provided, led the creative team at Shadowland to choose Spectres as their first feature film production. By the start of April, the clock was ticking. The creative team at Shadowland had less than three months to write the script, cast the film, raise the financing (half of which would be provided by Shadowland itself), and complete all aspects of post-production. Robertson worked closely with director Leirness in defining the characters so that by the time the first draft was completed, the two already knew which performers they wished to approach for most of the key roles in the film. 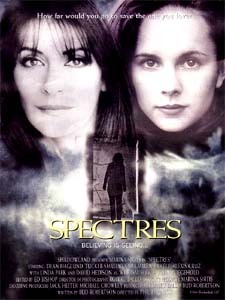 Although the story of Spectres follows Kelly on her journey of discovery, the most important role to cast was that of the mother, Laura Lee. The one element of the screenplay that came across quite strongly even in the first draft was that of the mother-daughter relationship. Marina Sirtis (Star Trek: The Next Generation) was the only actress Leirness ever considered for the role. She had the science-fiction background, but the real reason Leirness wanted Sirtis for the role of Laura Lee was his long-standing belief that there was nothing Sirtis could not do emotionally. Audiences that see Spectres will be treated to sides of this popular performer that they have never before seen. Casting proceeded smoothly, especially considering that what actors were looking at was a rough first draft screenplay that needed much work. What the approached performers quickly realised, however, was that their feedback on the script, and especially their characters was not only welcome, but expected. In this regard, performers like Sirtis, Dean Haglund (X-Files), Tucker Smallwood (Enterprise) and Alexis Cruz (Stargate: SG-1) became true collaborators early on in the process. As a director, Leirness knew that the most important thing he could do to ensure a good performance, was to cast the right actor in the first place and one of the things he enjoys the most is giving performers a chance to do something they haven't done before. It was that opportunity as much as anything that drew Linda Park (Enterprise), Loanne Bishop, Chris Hardwick and David Hedison (Licence to Kill) to the project. The role of Kelly presented major challenges and Lauren Birkell not only rose to these challenges as a performer, but the energy level and enthusiasm she maintained throughout the process was infectious and helped to support the effort of the crew on the other side of the camera. Before shooting began, she was not allowed to rehearse with the other performers and therefore not allowed to build up a comfort level or rapport with them. Spectres is a story about a lack of communication, and about the need we all have to change our perspective at times in order to be able to communicate. It was decided that the awkward silences and tension required between these characters would be more real, more immediate, if Birkell was kept shielded from the other performers. On any film, locations are important, but perhaps the most critical "character" in Spectres is that of the "house on the hill" where the bulk of the story's action takes place. After reading the script and being taken with the story, friends of Leirness volunteered their home in the Hollywood Hills for this location. With its' odd angles, three stories and rooms designed to capture specific emotions, the house enhanced the story and mood of the film in ways no built sets would have. In addition, the cast and crew of Spectres were hardly immune to encounters with the spirits purported to inhabit the house. Smallwood, for example, heard a seductive, feminine voice call his name and speak to him quite clearly. During one take, a streak of light that could not have been a flare or a reflection is seen flying past Sirtis. Because this is, in many respects, a haunting story about isolation, regret and a lack of communication, it was critically important that the emotions the characters are feeling be communicated visually, since they are so often not being addressed verbally. For this film to work, it needed to be one of long, lyrical takes, where the audience would feel the silences and the characters' isolation. The camera needed to always be moving in such a way as to create unease and a sense that the characters are always being watched. In addition to these visual approaches, director of photography Robert Ballo and director Leirness worked with chief lighting designer Mike Stockton and the art department to select colours that would further enhance the haunting mood of the film, while also revealing the characters' emotional state. The choice was made to shoot the film not on 35 millimetre, but on High Definition, using the Sony 24P. This allowed the filmmakers to more easily shoot rehearsals, and added an eerie, otherworldly clarity to the images. Principal photography was completed in just twelve days. For this to happen, on such a complicated film, with such a low budget, where even these popular performers agreed to work for scale, everyone needed to bring a passion for the project. Long hours working in peak summer heat on material that forced every member of the creative team to confront and explore painful emotions was made worthwhile by the knowledge that the project involved would be, at the very least, in Sirtis' words, "A good story, well acted".